There was a time where I struggled to live the life I wanted. Struggled to make my dreams a reality. No matter how hard I tried, it didn’t happen. If you’ve ever been there then you know the pains that I’m talking about. That ache in your gut caused by worry that you aren’t going to be able to provide the life you want for your family. The shear exhaustion that you feel in your whole body, in your mind, every single day as you fruitlessly try everything you can to improve your lot. You try everything, but never seem to make the headway that you seek. You’re spinning your wheels on a wet road while you watch others drive past and get to the exact place that you are trying to go. If only your wheels would grab. You’d accelerate like a rocket! But they never do. They just keep on spinning. It’s a terrible place to be. Feeling like you’re stuck on the road to the destination you hope to reach. But, for me, it was a pivotal moment. Because, I took that pain, and made a decision… a decision that I WOULD NOT live this way forever. I made a decision to make more of the green stuff that would surely make my pains go away. I made a decision to learn about that elusive green stuff and how to get more of it. And I did – I’ve now made millions of it. But my millions is just the beginning. Because, I have a burning DESIRE to help others improve their lot in life. I have a burning desire to help others retire RICH (especially if you’re 40 years old or older). So if you’re looking to make it to the destination you hope to reach, a wealthy destination, then allow me to be your guide. Allow me to be the pit crew that gives you new tires that will stick to the road and begin accelerating you to new speeds. What do you have to lose if your wheels are spinning fruitlessly right now (or you’re not moving quite as fast as you’d like)? 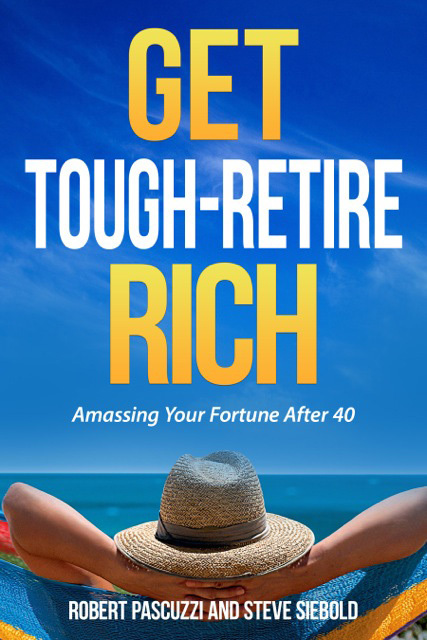 Take 5 minutes out of your day, and grab a copy of my new book “GET tough RETIRE rich”. In it, I’ll show you everything you need to know to do just as the title suggests and retire rich.